In comics, superheroes often have "scientific" origin stories involving radiation or strange chemicals. But what would actually happen if you experienced one of these origin stories in real life? Let's take a look at six classic superhero tales and find out. Origin: Four adventurers make a rushed test flight of a spacecraft due to a fear of having their Air Force research funding cut off. During the flight they are bombarded with cosmic rays, giving each of them separate super powers. Or, in the case of the Thing, really awful acne that masquerades as rock. Talk about putting your neck on the line for a grant. I've built a spaceship, and the Air Force funding agency is cracking down on me for results - I'll sneak away on the rocket and take my future wife, her brother, and my best friend on a ride. What's the worst that can happen? Well, actually, if the trip is successful, not a whole lot. Get the Geiger counter from off your bookshelf that you bought off eBay (we all know good io9 readers have one). Turn it on and bump the sensitivity level up. You hear that pinging noise? Your Geiger counter is picking up the signal from cosmic rays. These rays, however, prior to humanity putting a significant number of people in space, were of particular concern, so Kirby and Lee are not to blame for this plot point. Cosmic radiation was and still is a concern on the part of sending humans into space. The Apollo astronauts noticed "flashes" of light in their eyes, possibly induced by cosmic radiation, however, their short term in space (often less than two weeks) did not yield any significant detriment to their health. Individuals on longer missions would more than likely exhibit more detrimental effects, and a report has recently suggested lifetime limits on exposure to cosmic radiation (in the article The Cosmic Ray Radiation Dose in Interplanetary Space - Present Day and Worst-Case Evaluations), which will play a role when humanity makes its fateful journey to Mars. So, long story short, no one becomes partially invisible at will or gains the ability to stretch their limbs, but at the very worse, their exposure to cosmic rays leaves the crew with spots in their eyes and Benjamin Grimm with one less thing to complain while sitting on the stoop of his Yancy Street home. What would likely be more damaging to the health of Richards and company would be their impending return to Earth. In the comic they crash, which in reality, would be fatal. But given the Cold War climate of the comic (and the War on Terrorism world we live in now), their stolen craft, an unauthorized space vehicle, would more than likely be captured upon re-entry or blown up by one of the many governments of planet Earth. If Reed, Sue, Johnny, and Ben somehow do survive, they are likely horribly injured and living out their lives under interrogation in an undisclosed government facility. 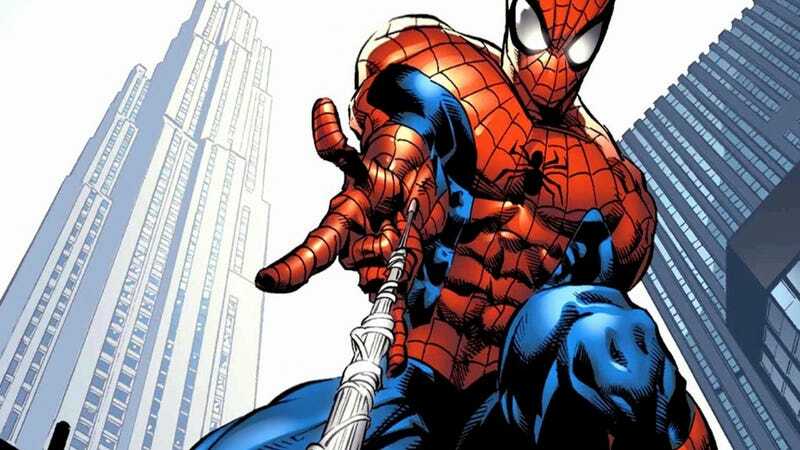 Origin: Peter Parker is bitten by an irradiated spider in its death throes, granting him the spider's special abilities. We are not told what the spider was irradiated with, which would be a unique feat in and of itself, but, for the sake of argument (and the fact that modern retellings of Spider-Man's origin put a DNA hybridization twist on the mythos), let's say the phosphates in the spider's DNA backbone were replaced with a radioactive isotope of phosphorous, Phosphorous-32 . This isn't the worse thing that would happen, as half life of Phosphorous-32 is roughly fourteen days, so it won't be in Peter's body forever and would likely be excreted through the urine. Phosphorous-32 is also a beta emitter, so it would be blocked by a thin sheet plastic, and therefore wouldn't do much harm to the surroundings or Peter's classmates. Even if the spider injected Parker with an amount of venom commiserate with the entire weight of the spider, the chance of Parker becoming harmed from the added radioactivity is negligible (this is bolstered by the fact that foodstuffs irradiated in the recent Japanese nuclear plant meltdowns are now considered edible), with the toxicity of the spider venom playing more of a role in Peter's morbidity. Spiders share a significant portion of DNA with humans, so it would be necessary for all of the "different and power inducing portions" of the DNA to be adopted and amplified in Parker's DNA within a rather short time, something that the record of time has shown is not going to happen. If it did, we would see people being bitten by irradiated insects and animals and taking on their characteristics. I call dibs on the radioactive dolphin. Peter Parker more than likely stays a nerdy teenager, marries well, and becomes the respected researcher that makes bad puns during his talks at AAAS Annual Meetings. Uncle Ben might not die as well to boot, but there is a little more riding on that outcome than a spider bite. Origin: A freak accident occurs and Barry Allen (or Wally West if you have a more contemporary flavor) is covered by chemicals that have been struck by a bolt of lightning, only to be imbued with the ability to move at super speed. The Flash was forensic chemist before forensic chemistry was cool and became the basis of most prime-time network programming. But do you remember what the shelves in your chemistry lab looked like? If they were anything like mine, the wooden shelves had acids next to bases next to volatile organic solvents and rusted containers of God knows what. I don't want that stuff on me, let alone struck by lightning, ignited, and spilled all over me. Sadly, the outcome for Barry Allen and Wally West is a quick death or years of rehabilitation and painful skin grafts, not super speed and a cool jumpsuit that pops out of ring. Origin: Trauma from seeing his parents killed before his eyes turns a billionaire boy into a one man crime-fighting army. Alright - I've hated on those I love enough, so let's visit some superhero origins with a bit of real life merit. Batman's story hinges on four points in my opinion: 1) Bruce Wayne had to sit through Die Fledermaus as a child, 2) his parents were killed in front of him immediately thereafter (a great case for the avoidance of musical theater via operant conditioning if there ever was one), 3) he fell through a cave full of bats, thus imprinting the creature on his psyche, and 4) access to infinite resources. Bruce Wayne could do essentially whatever he wanted (and whatever seemed reasonable due to his fractured psyche), but his actions would probably not permit a multi-decade crime fighting career as portrayed in the comics. He would get a couple of good shots in, but more than likely his demeanor and gravitas would cause too much attention to be turned his way, with negative results. With the genetic aid of a condition like CIPA (congenital insensitivity to pain with anhidrosis), Batman could possibly further his career, as long as any fractures or infections not known to Bruce were taken care of lovingly by Alfred. The origin and creation of Batman is feasible (as would be another vendetta induced character, The Punisher), however, his ability to perform over an extended period of time and long-term survival would be in question. For an extended look at the psyche of Batman, take a look at Charlie Jane Anders' recent Top 10 Greatest Mentally Ill Superheroes. Origin: An alien symbiote latches onto Peter Parker while he is on the planet Battleworld fighting in the Secret Wars, only to change Peter's emotions and be discarded a couple of years later. The symbiote quickly finds a willing host in Eddie Brock, who becomes the sometimes bad guy, sometimes good guy Venom. Symbiotic relationships are common in nature, take for instance humans and domesticated animals or our digestive system and bacteria. The Venom/Eddie Brock symbiosis may represent an extreme form of such a relationship, granting enhanced physical powers and athletic performance, however, it is still a symbiotic relationship nonetheless. The "Venom" symbiote itself also has powers, as it can change shape and move on its own, particularly when it is in need of another host. Based on the widespread variety of symbiotes in nature, I say this could be possible. Granted, the correct relationship would have to be present in the universe, and with our small understanding of the universe around us and what types of alien life forms might be present, a physically enhancing symbiotic relationship could be possible. I just can't rule this one out. Origin: A government researcher finds himself able to shrink in size and control large groups of ants through use of special equipment. First, let's put the size changing aside. I'll go ahead and admit that to be outside the realm of possibility. But the controlling of ants or other insects through electronic means? Completely believable, and something that researchers are trying to do right now. The USDA currently catalogs a variety of sounds made by insects in a number of situations, available here, for wildlife monitoring purposes. With enough study, these sounds could one day be used to successfully manipulate a group of insects (akin to hunters using a turkey call). A group of Swedish researchers are also looking at the use of pheromones to manipulate groups of moths. Both research avenues are particularly viable from a funding standpoint, as they could control the insect population without harming the insects themselves or the environment. Your grandkids will have an Ant-Man helmet that you bought them for their birthday from Target. Don't cross them. Images courtesy of Marvel Comics and DC Comics.